Something magical happens when you combine crumbly, smokey bacon with a sharp bleu cheese and sweet, grilled nectarines. I love the combination of juicy fruit with crispy bacon and the sharp flavors of a nice bleu cheese. This salad would also be great with many different fruits; it can be prepared as an autumn salad with grilled pears, which would be a special addition to any Thanksgiving or holiday table. Grilled nectarines and peaches may sound weird; I thought so too, at first. My dad grilled some peaches many summers ago and served them just like that; on a plate, sprinkled with salt and pepper and drizzled with olive oil. They didn’t even need anything else to go with them. Once you slice into one, you’ll see. This technique goes for many fruits; the grill caramelizes the outside, causing the sugars in the fruit to deepen just a bit more. This salad is actually very simple. Just choose your favorite bleu cheese (we chose a slightly smokey Danish bleu), crisp up some bacon, and toss everything together with freshly chopped romaine and a sweet balsamic glaze. Perfection. To make this salad a meal, consider adding a piece of grilled salmon or chicken. Preheat your grill to medium-high heat. Slice each nectarine, carefully removing the pit. Coat the nectarines with olive oil and sprinkle with salt and freshly ground pepper. Grill until there there are slight char marks and the nectarines have caramelized a bit. You’ll know they are done when they lift from the grill without too much force (so be sure to use enough olive oil!). While the nectarines are grilling, heat a pan and cook the bacon until it is crispy enough to crumble. Once it is done, remove the pieces to a paper towel-lined plate to absorb the excess grease. Once everything is done, slice the grilled nectarines, crumble (or chop) the bacon, and while you’re at it, chop up some refreshing romaine. Top the romaine with your decadent nectarines, bacon, and crumbled bleu cheese, and drizzle with a little olive oil and balsamic glaze. Bon Apetit! One time while I was in California with my Mom and my sister we visited a nice restaurant right on the beach. My Mom ordered a grilled romaine salad, which I imediately wrote off as one of the grossest things I had heard of. But when her salad came, piled high with goodies and a creamy cilantro dressing, I was super jealous. She let me taste it and I regretted my order and wished I had gotten the salad, too. Since then, Grilled Romaine Salads have become a favorite summer dinner. They are so satisfying and flavorful in a way that normal salads just can’t match! Heat your grill to medium-high. Halve each romaine heart and rub with olive oil. Husk each ear of corn and rub with olive oil. Salt and pepper both the corn and the romaine. Wrap each ear of corn separately in a sheet of aluminum foil. Grill the corn first; it will take longer to cook. Turn it often so that one side doesn’t burn. Meanwhile, chop the red onion and tomato and set aside. In a food processor, combine the soft cheese, sour cream, lemon juice, minced garlic & onion, and cilantro. 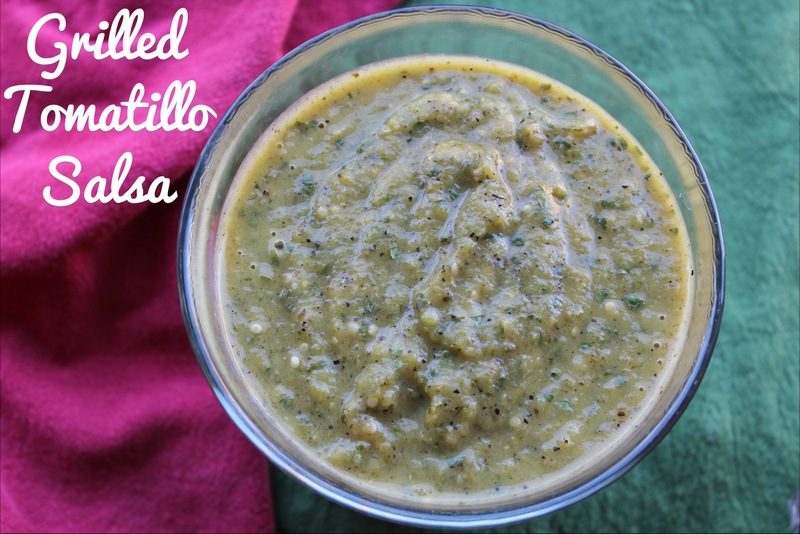 You can also add minced jalapeno if you want your dressing to be spicy. Blend until smooth and then stream in 1/4 cup of olive oil. Add salt and pepper to taste. Grill the romaine first face-down just long enough to get char marks and to lightly wilt the lettuce. Then flip the romaine and grill on the other side for about a minute. Remove to a plate and set aside. Remove the corn from the foil and cut the kernels off of the cob. To assemble, spoon cilantro dressing over the romaine and top with tomato, red onion, corn kernels and bacon (optional). Serve with a lime wedge. Ps- the perfect dessert to go with this is grilled peaches with vanilla ice cream (you can even see them grilling in the picture above). I’ll be sharing that recipe this weekend! The Arizona heat has crept up on us this year. The sun’s warmth on our skin is a reminder that Summer will be here before we know it. It’s the time of year when the birds are chirping, the sunshine is warm but the breeze is cool, and the air is fragrant with slight scent of flower blossoms. It’s funny how time can go by so quickly. In Phoenix, Spring comes earlier; while those in some states are watching snow fall, Arizonans are rolling out their beach towels and firing up the grill. 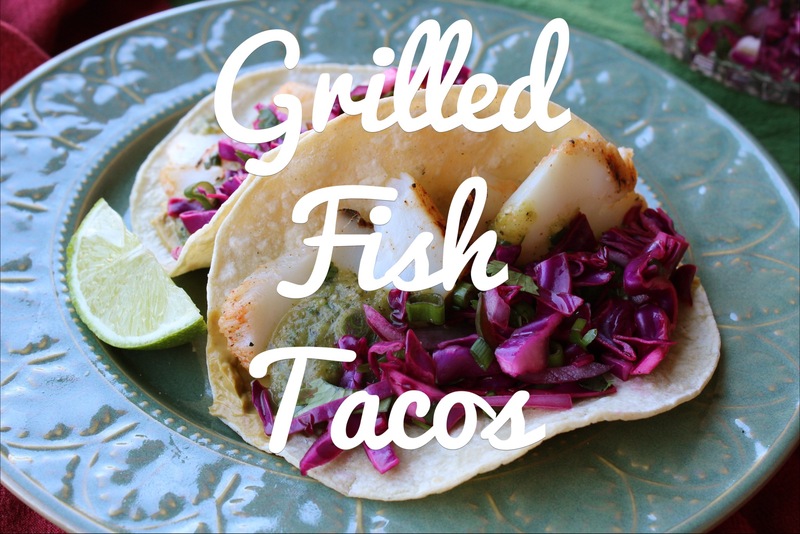 Around this time of year (and let’s be honest, also year-round), my fish taco craving kicks into high-gear. Fish tacos are the staple food of summer for me. Their perfect combination of fresh citrus and a hint of spice lets us think of sunshine and pool time. We enjoyed these tacos al fresco, with sound of the breeze through the palm trees, reminiscent of sunny days on the shore in Coronado. This recipe combines a tangy green salsa with a smoky avocado cream, a zingy cabbage slaw and fresh marinated cod served on lightly crisped tortillas. We didn’t waste any time before digging in, poolside of course. Spices (chili powder, garlic powder, lemon pepper, paprika, etc.) to your liking. Combine citrus juices, tequila and adobo sauce and whisk together. 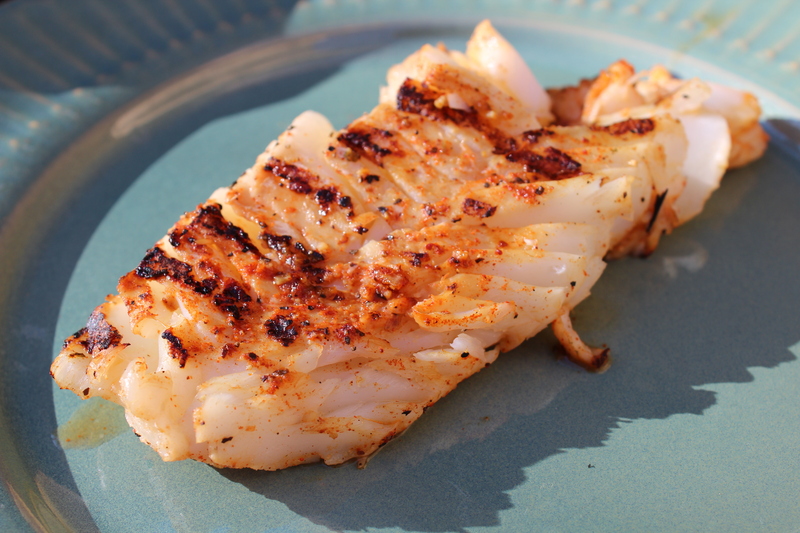 Place fish in marinade and refrigerate for at least an hour. Turn the fish over halfway through to ensure even coverage of the marinade. Remove fish from marinade and sprinkle with spices of your choice. Use an oiled paper towel and a pair of tongs to oil your heated grill. Sear the fish on both sides until done, about 10 minutes total. Alternatively, you can grill it in foil, which keep the fish from falling apart. Combine poblano, tomatillos, jalepeno, and onion in a metal pan. Rub with olive oil and place on the grill over medium heat. Allow the peppers and tomatillos to char. Once they are done, remove the poblano and place it in a paper bag. Place the rest of the ingredients in the bowl of a food processor. After about 5 minutes, remove the poblano from the bag and peel the charred skin off of the pepper. Cut the poblano in half and remove the stem and seeds, place the flesh of the pepper into the bowl of the food processor. Blend all of the ingredients together until smooth, tasting for salt. Refrigerate until needed. Combine all ingredients in the bowl of a food processor and blend until smooth. You can add more water to help it along if it gets too thick. Refrigerate, covered, until needed. 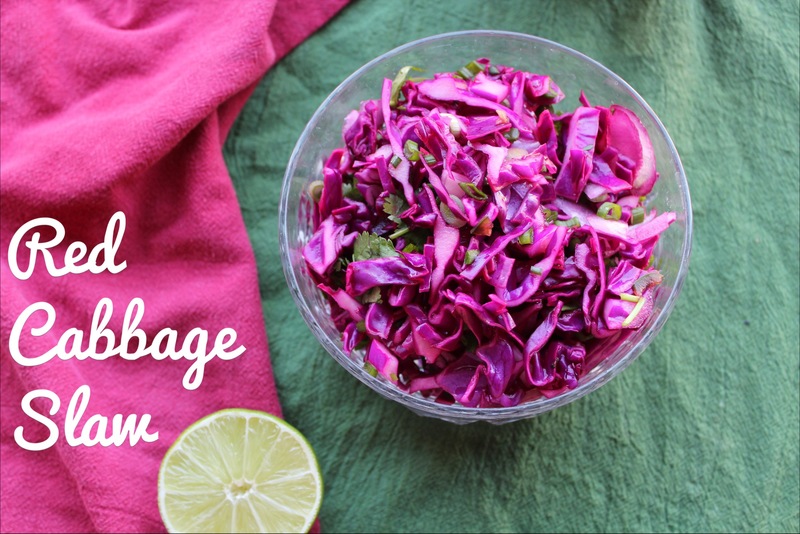 Thinly slice cabbage and red onion and combine with minced jalepeno. In a separate bowl, dissolve brown sugar in the lime juice and rice wine vinegar to make a light sauce. If you prefer a creamy slaw, you can also add greek yogurt or light sour cream. Mix all ingredients together and refrigerate until needed. Toast five tortillas on the grill. 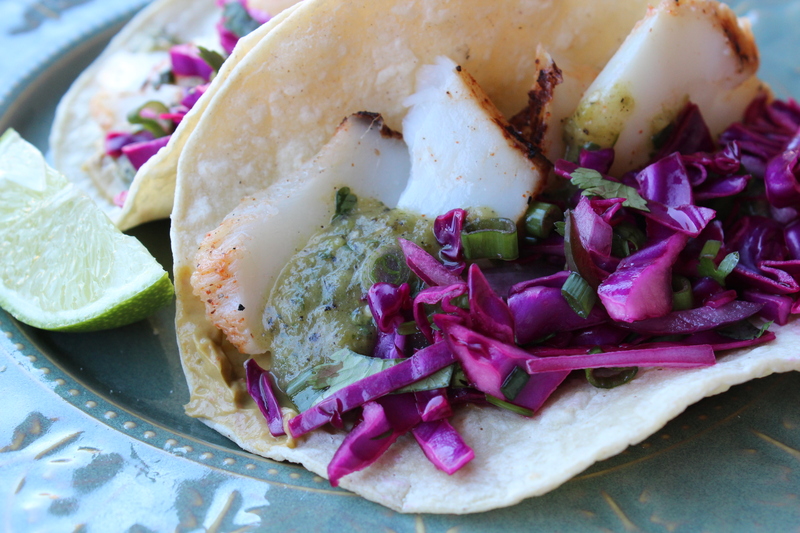 Spread a bit of each sauce on the tortillas and top with grilled cod and cabbage slaw. Serve with a lime wedge. The avocado cream is the most addicting thing I have made in a long time. I whipped up a huge batch for our Bachelor season finale last Monday and everyone was raving about it! 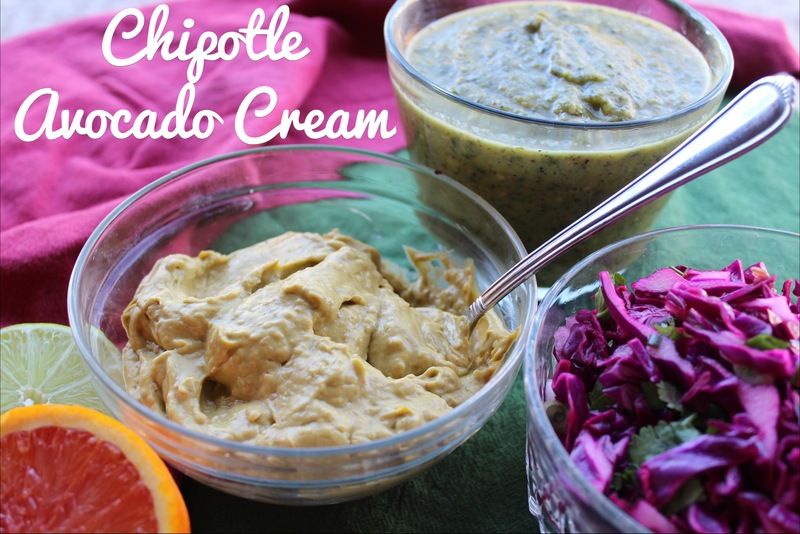 Even if you don’t make the tacos, just make the avocado cream. It’s great with chips or any Mexican-style dish. These tacos would also be fantastic with a Watermelon Mojito, don’t you think? You could even adapt it to a Watermelon Margarita! A few years ago, these grocery stores called Fresh & Easy started popping up everywhere in Phoenix! I love them because they offer fresh produce, cheeses, meats, as well as many ready-to-go meals. 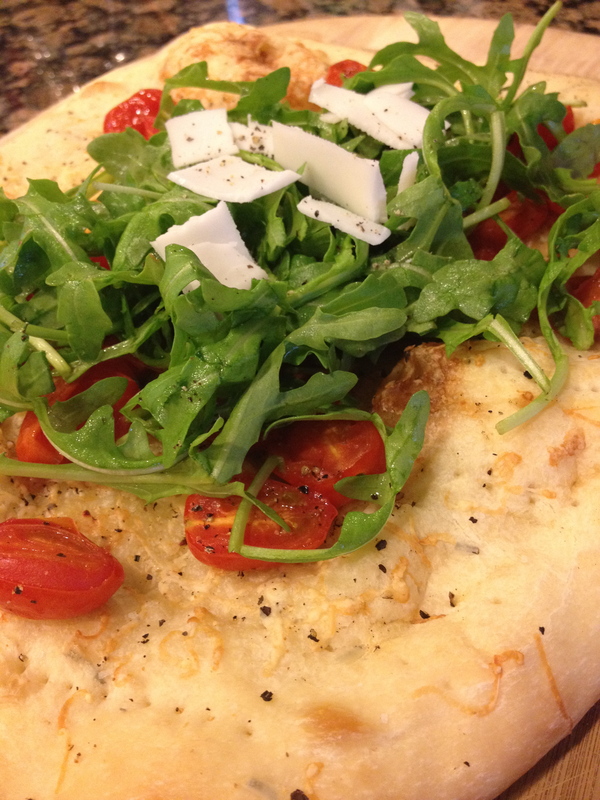 In addition, they sell delicious pizza and focaccia doughs so that you can make homemade pizza! Their rosemary focaccia dough is my absolute favorite. It can be paired with just about anything: used in a sandwich, grilled and dipped in olive oil, and even used as a pizza or flatbread (as in the recipe below)! One of Fresh & Easy’s cheeses is my new obsession. I am always looking for new cheeses, and I am so pleased with this find- I really love goat cheese, and Fresh & Easy sells a delicious goat gouda that I got during my last visit. It is so flavorful, I can’t wait to go back and get more! 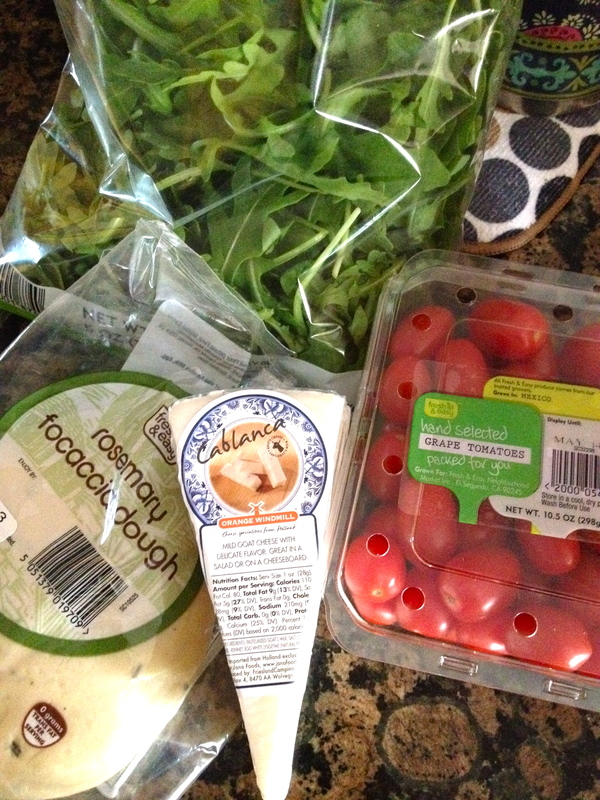 In addition, I enjoy the arugula that Fresh & Easy sells. It has such a nice bite; I have tried arugula from other groceries in my area but none of them are as balanced as Fresh & Easy’s. I decided to stop by Fresh & Easy and pick up these items, as well as some grape tomatoes, and make a nice flatbread for dinner. Fresh & Easy makes it so simple to put together a delicious and quick meal on week nights. 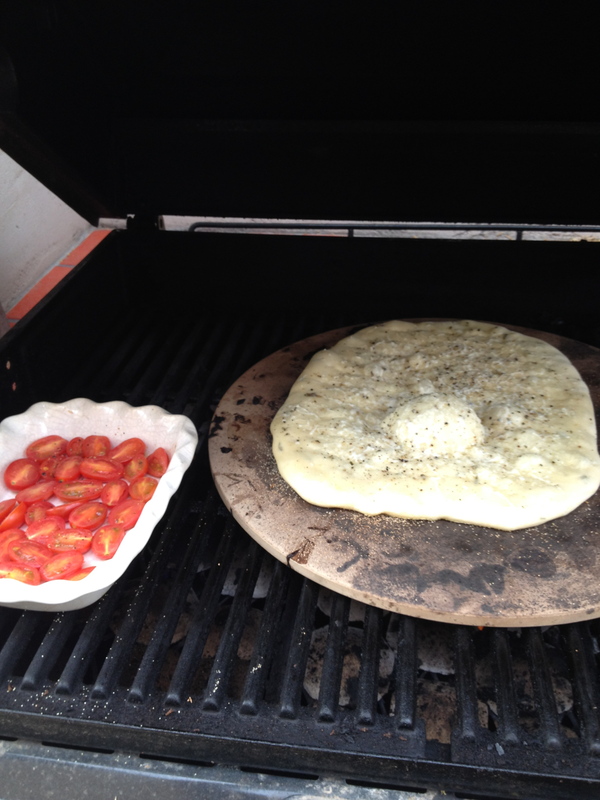 Preheat your grill and place a pizza stone directly on the grates. 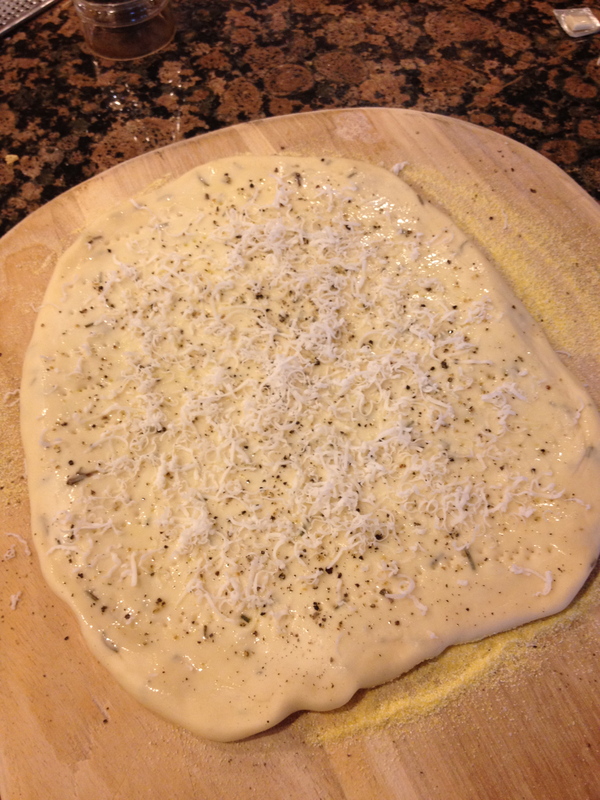 Roll out the focaccia dough using flour to prevent sticking. 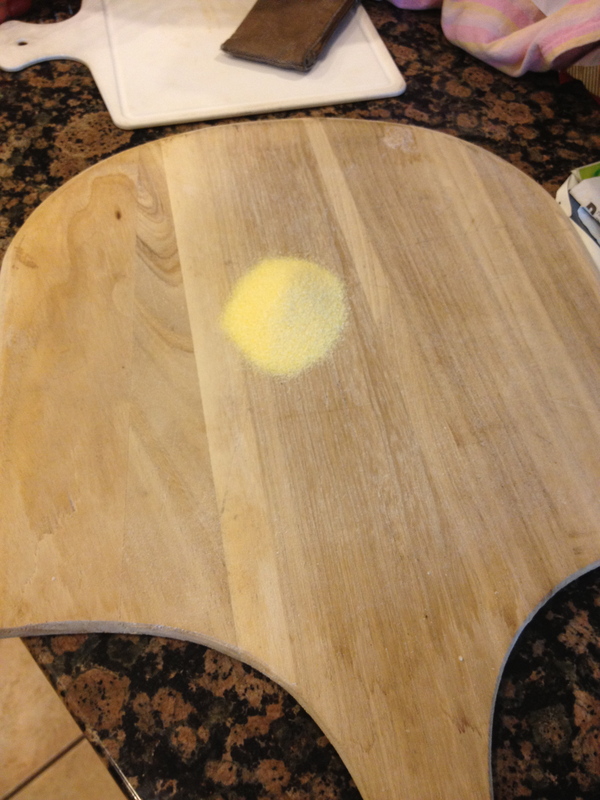 Place 3 tbsp corn meal on a pizza peel and spread it around evenly. Place the rolled out dough on top of the corn meal. Take a fork and pierce the dough all over the center, save for about 1/2 inch around the edges to make a crust. 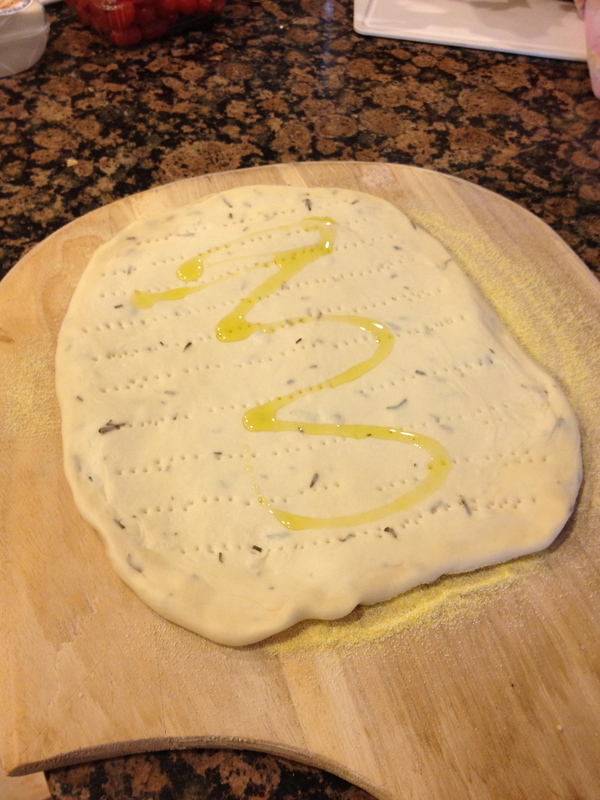 Drizzle 1/2 tbsp olive oil over the dough and spread around with your fingers. Sprinkle dough with sea salt and freshly cracked pepper. Top with the grated goat gouda. In a small CorningWare® dish, smear olive oil all around to prevent sticking. Place halved grape tomatoes face up and drizzle with remaining 1/4-1/2 tbsp olive oil. Sprinkle with fresh pepper. We have a gas grill that has three vertical sections of coals. When we grill a pizza or flatbread, we turn on all three sections at first to preheat our pizza stone, then turn off the middle one to cook the pizza/flatbread so that it cooks evenly. So, if you have this option, turn off the middle section and then place your flatbread (using your pizza peel) onto the pizza stone. While the flatbread is cooking, place the tomatoes in the CorningWare® dish directly on the grill and let cook while the pizza is cooking. 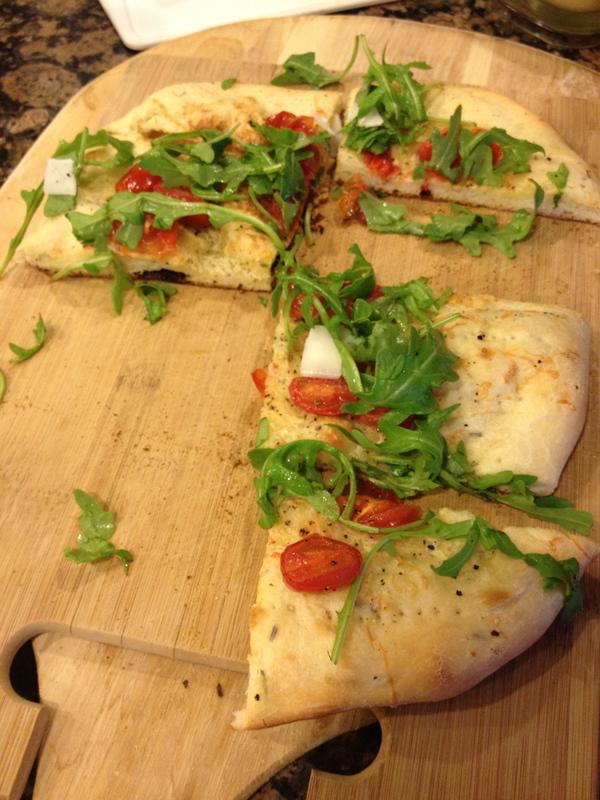 Cook flatbread until the dough is done and remove using your pizza peel. Remove the CorningWare® dish carefully with oven mits. 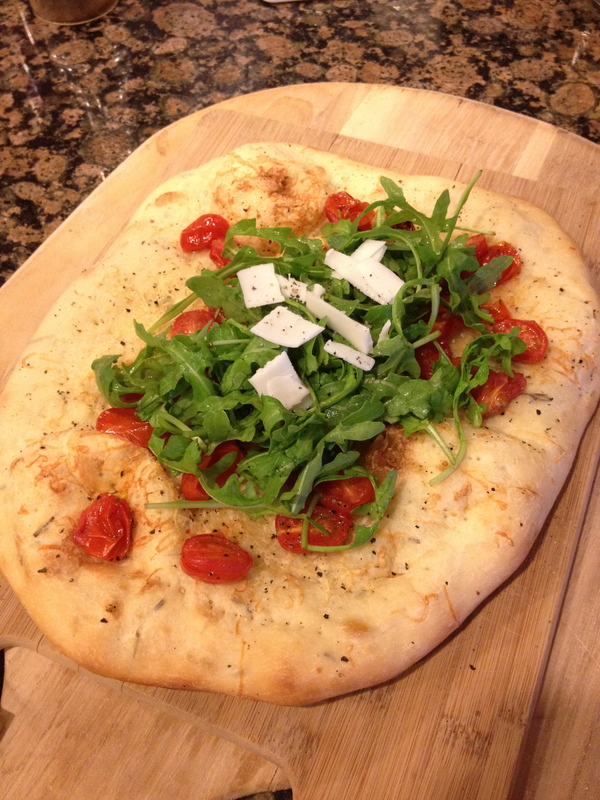 Top the grilled flatbread with the grill-roasted tomatoes, a handful of fresh arugula, and shaved goat gouda. Cut into squares. Enjoy! What is your favorite new foodie find? I feel that it is important to note that this was not a sponsored post, I just really love Fresh & Easy and was inspired by the ingredients found there.